Such as there is is modest. The third church is thought to have had three 'gret' bells, but as you will see from the extract from Volume 17 of Lincolnshire Notes & Queries, by the time of the Reformation (16th century) there was only one, as today, lending credence to the idea that the church was in decline well before the Roundheads incident, to which William Wright (see A Short History) attributes its destruction. Maybe the Roundheads completed a process which had been ongoing for some time. The bell, which dates from 1611 and is inscribed, 'God save His Church', was rehung in 1998 after it had been furnished with a new clapper, the original having dropped off. An Elizabethan chalice is on loan to, and occasionally on display in, Lincoln Cathedral, having been deposited there by William Wright - see Volume 19 of Lincolnshire Notes & Queries. 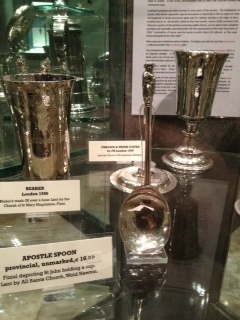 There is also a silver apostle spoon dating from 1600 on loan to the catherdral and currently on display there (right).